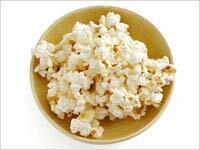 SUNDAY, March 25, 2012 (Health.com) — Popcorn isn't just low in calories and high in fiber. Turns out the popular snack is chock full of antioxidants, too. Polyphenols, a type of plant-based chemical found in foods ranging from vegetables to chocolate, help neutralize the harmful substances known as free radicals and are thought to protect against heart disease and other health problems. "Nobody had paid much attention to popcorn as a source of anything other than fiber," says lead researcher Joe Vinson, Ph.D., a professor of chemistry at the University of Scranton, in Pennsylvania, which funded the study. "Popcorn has more antioxidants in total than other snack foods that you can consume, and it also has quite a bit of fiber." Vinson and his colleagues analyzed four brands of commercially available popcorn. After grinding kernels (both popped and unpopped) into a fine powder, they separated out the polyphenols by adding a pair of solvents—a process that roughly mimics what happens in the stomach as food is digested, Vinson says. A single serving of popcorn—about two tablespoons of unpopped kernels—contained up to 300 milligrams of polyphenols, the researchers found. By contrast, the average polyphenol content of fruit is about 160 milligrams per serving, while a single serving of sweet corn contains 114 milligrams. Some types of polyphenols are pigments, and in fruit the biggest concentrations tend to be found in the skin and seeds. Similarly, the hull or outer skin of the corn kernel—the stuff that gets stuck in your teeth when you're munching away—was the richest polyphenol source. "That's where the antioxidants are, that's where the fiber is," Vinson says. "You shouldn't throw that out." The findings don't mean that popcorn should replace apples and oranges in your diet, of course. "Popcorn is no substitute for fruit," says Michael G. Coco, an undergraduate chemistry student at the university who participated in the study. "Fruits have other vitamins and minerals that popcorn does not contain." However, the findings do suggest that popcorn is a healthy alternative to snacks such as chips and crackers. In addition to the polyphenols and low calorie content, popcorn is 100% whole grain, Vinson and Coco point out. Eating more whole grains has been linked to a lower risk of heart disease, diabetes, and certain types of cancer. "This is great news in terms of getting other whole grains in your diet," says Carolyn Brown, a registered dietitian and nutritionist at FoodTrainers, in New York City. "We're always trying to diversify. Everyone's kind of stuck in this wheat rut." But popcorn isn't always healthy, Brown adds. Movie-theater popcorn drenched in butter is the opposite of a health food, she says, and some microwave and pre-popped varieties contain artificial or less-than-healthy ingredients—such as partially hydrogenated oils—that shoppers should be mindful of. "Not all popcorn is created equal, and you can get some nasty stuff in there—especially with the microwave popcorn." The healthiest way to prepare popcorn is to use plain kernels in a stove-top popper (such as a Whirley Top) or air-popper, Brown says. Adding a little olive oil or butter is fine, she adds, and popcorn can also be jazzed up with a sprinkling of low- or no-calorie flavorings such as parmesan cheese or chili pepper. The American Chemical Society is a professional organization for chemists and scientists. Unlike the research published in scientific journals, Vinson's findings have not been thoroughly vetted by other experts in the field.